In a small, windowless room on the 40th floor of the Seattle Municipal Tower, two of the city’s most prominent lawyers are wrestling over the future of Pioneer Square. David Bricklin, who co-founded the Harvard Environmental Law Review and who’s argued before the U.S. Supreme Court, sits on one side of a hearing table, retained by a group of people who live, work and own property in Seattle’s most historic neighborhood. Jack McCullough, the land-use attorney who helped broker Mayor Ed Murray’s new affordable-housing deal, is on the other side, representing a Portland-based real-estate developer with a plan to erect a 12-story, 200-unit apartment building at Alaskan Way South and South Jackson Street, where the neighborhood meets the waterfront. Witnesses answer questions about the project that opponents say would loom above buildings from the late 19th century and ruin Pioneer Square. “Like a cactus in a rose garden,” neighbor York Wong said in an interview last week. 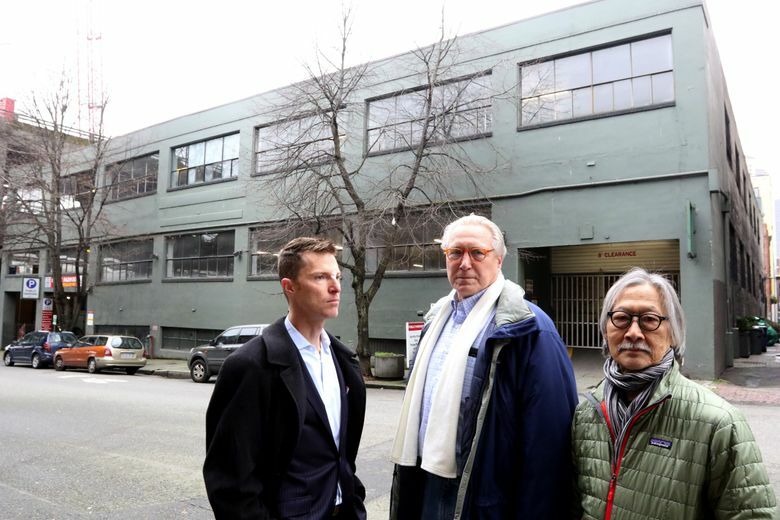 Wong and other foes are appealing two decisions by city officials — one granting Gerding Edlen Development a land-use permit and the other giving the company the special approval it needs to build in the Pioneer Square Preservation District. The opponents say the planners who granted the permit made errors when they determined the project wouldn’t harm its environment, and they argue Department of Neighborhoods Director Kathy Nyland was wrong when she approved the project, taking an unusual step by overruling the Pioneer Square Preservation Board. Gerding Edlen didn’t return multiple requests for comment. In legal documents, the developer has defended the decisions as appropriate and its project as reasonable. The project planned for 316 Alaskan Way S., now the site of a 107-year-old building used as a parking garage since 1919, would boast stunning views of Elliott Bay. The garage is historic but doesn’t need to be saved, according to the preservation board. The Alliance for Pioneer Square, a neighborhood-revitalization advocacy group whose chairman emeritus is former Mayor Charlie Royer, supports the project. The Alaskan Way Viaduct crowds the garage on its west side, so cars rumble past the upper stories of the structure. But the viaduct is supposed to come down as soon as the deep-bore Highway 99 tunnel under construction below downtown is completed. Existing buildings nearby are mostly brick and three to five stories, some from the Klondike Gold Rush years, when Alaska-bound prospectors hurried through Seattle. But thanks to zoning changes in 2011 meant to spur residential development in a beloved but gritty part of the city, Pioneer Square buildings may now rise 120 feet. The proposed structure would be 100 feet straight up from the street, with another 35 set back on top. That’s what planners noted about the project’s height, bulk and scale. Nyland, who took over Neighborhoods last June, made similar points in overruling the preservation board, which voted 7-1 against the historic-district approval. 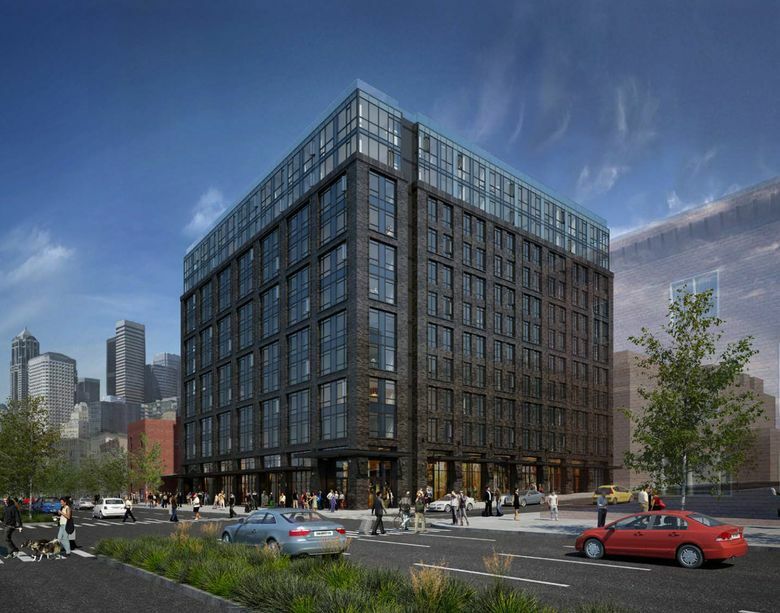 Some other large projects are in the works for the neighborhood, Nyland noted, among them 450 Alaskan Way S., where a nine-story office building is planned. Though Nyland was mostly satisfied with the project’s design, saying it would fit with Pioneer Square’s historic warehouses, she ordered some modest alterations. 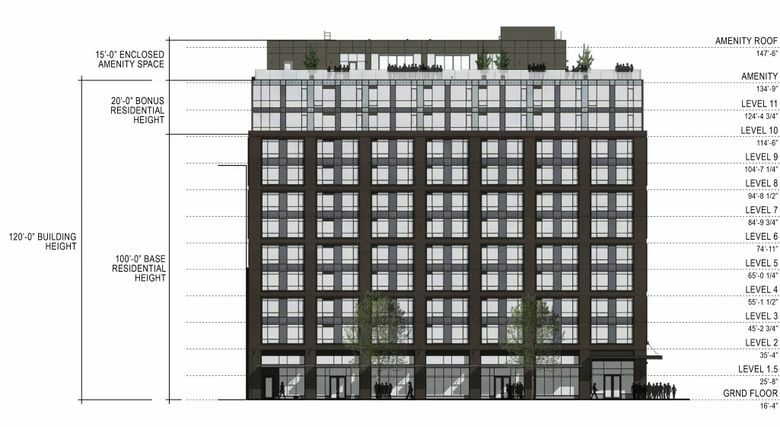 The building will have ground-floor storefronts and will be nine floors of dark brick with bay windows below two stories of glass and an enclosed rooftop space. But the opponents were far from satisfied. They argue historic considerations are more important than zoning and worry the project would set a bad precedent. The demolition of the viaduct should reunite Pioneer Square with the waterfront, but a row of new high-rises along Alaskan Way would sever them again, the critics say. “We’re going to have Miami Beach on Elliott Bay,” said Wong, 78, playfully comparing Alaskan Way South to the famous Florida stretch where much taller towers soar above surf. The former Evergreen State College professor and some of the other foes live at 80 S. Jackson St., just east of the site, across an alley, and residents of the four-story condominium have been accused of opposing the Gerding Edlen project in order to protect their own views and property values. Wong says his objections have nothing to do with his windows, which point the opposite direction. Wong says he’s involved because Pioneer Square’s soul is at stake. Proponents told the preservation board the project would make Pioneer Square safer at night by making it more residential and provide much-needed housing. When Wong began fighting the project, he was outgunned, he says. But Bricklin, the attorney, paid historic-preservation consultants and volunteer help from a University of Washington architectural history professor have given the opponents some firepower. The hearing is scheduled to end Friday after three days of testimony. Watanabe will likely issue a written decision at a later date. Whether she sides with the developer or opponents, her ruling could be appealed to the state Supreme Court. Michael Sullivan, another consultant for the foes, says the case speaks to tension between development and history in a growing city. “The protections for these neighborhoods are starting to buckle,” Sullivan said.